Our Honda Dealership near Dallas has the all-new Honda Clarity Plug-In Hybrid in stock now. This new five passenger hybrid sedan is powered by Honda’s two-motor hybrid technology. New Clarity drivers can choose between fully electric and hybrid operation as well as between three operating modes; Normal, Econ and Sport, allowing for a customized driving experience with maximized performance and efficiency. This new Honda features LED exterior lighting, Smart Entry with push-button start, Honda Sensing® technology and an 8-inch Display Audio touchscreen interface with Apple CarPlay™ and Android Auto™ integration. 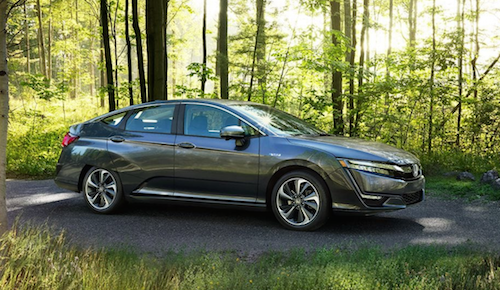 The Honda Clarity Plug-In Hybrid is available as either the base or Touring model and is offered in several exterior colors, including a new Forest Blue Pearl exterior option. Our Honda dealer near Dallas, GA has affordable financing options available as well as frequent special offers and lease deals that will help you save money with lower monthly car payments. Of course the Honda Clarity Plug-in Hybrid will also help you save money at the pump. If you would like to learn more about this innovative new Honda hybrid stop by and take a test drive at the Ed Voyles Honda dealership near Dallas, Georgia.